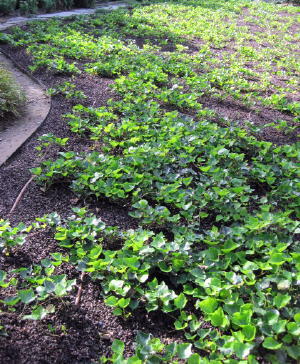 Remember what the new Ivy groundcover looked like just after planting last May? 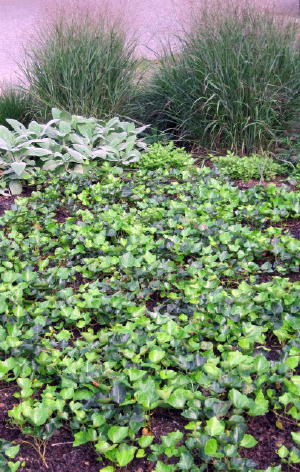 The groundcover, Hedera helix ‘Baltica’ (English Ivy) showing results in late August. Although 1/3 of the starter plants died, plenty of Ivy sprigs have thickened into lush plants, setting roots as they spread. Areas with more shade grew much faster. 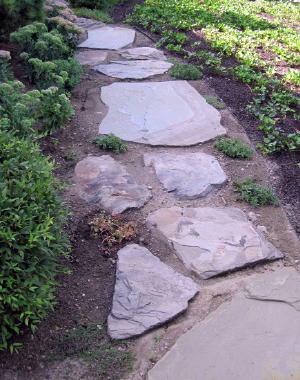 We added more Flatstones to connect the front & side paths and seperate the ivy from the shrubs and perennials at the house foundation. The Ivy contrasts nicely with surrounding perennials and shrubs. It’s amazing how quickly the Ivy has grown from those small sprigs in flats into a lush carpet of evergreen groundcover in our front yard. By next spring it will look like it’s always been there. 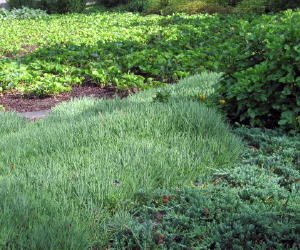 With as little as 10 minutes of weekly weeding and supplemental watering only twice this season, it is decidedly the way to go for low maintenance and water conservation. Now we just sit back, relax and wear ear plugs while the neighbors continue to mow their lawns – that weekly ritual they all secretly dread. 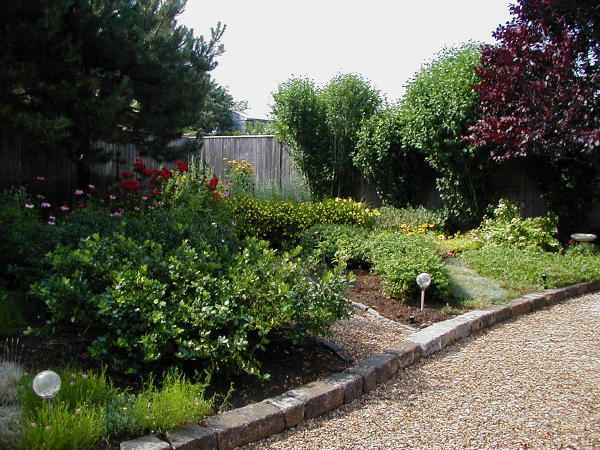 Drought tolerant Thyme, perennials and shrubs work well in this sunny, narrow entry garden. 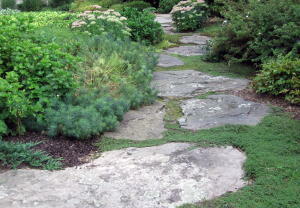 Thyme and Vinca are very effective in this narrow border to a driveway I saw on Martha's Vineyard this summer. 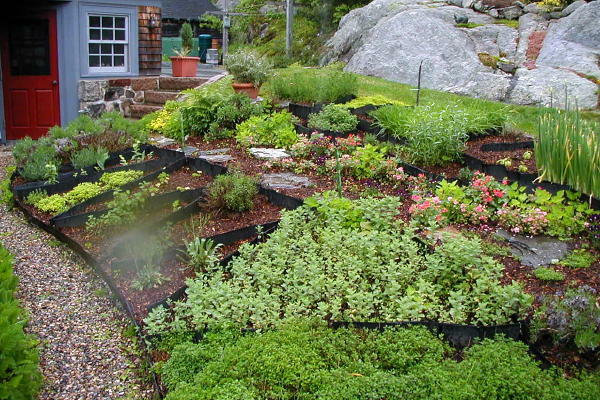 An herb garden on a slope was a creative solution seen on a local garden tour. 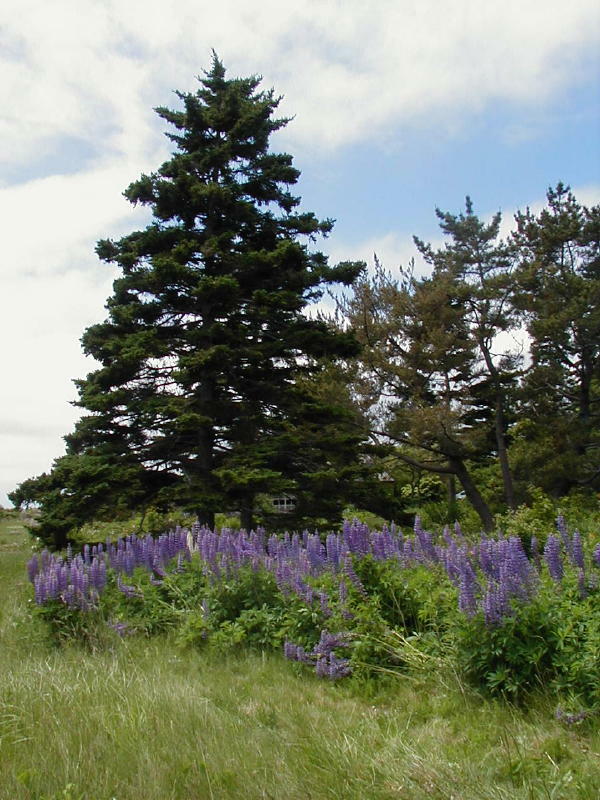 A field of Lupine adds color and a natural look to this property line planting. 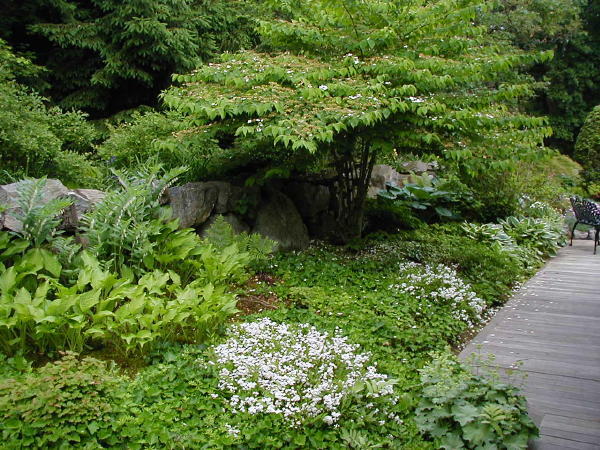 Mixing trees, shrubs, perennials and gravel to create an alternative backyard look. 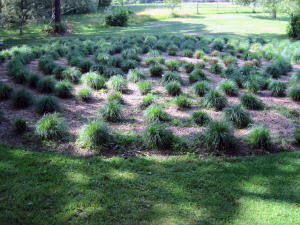 Ornamental grasses are used in this public space, creating a focal point in a large lawn area. 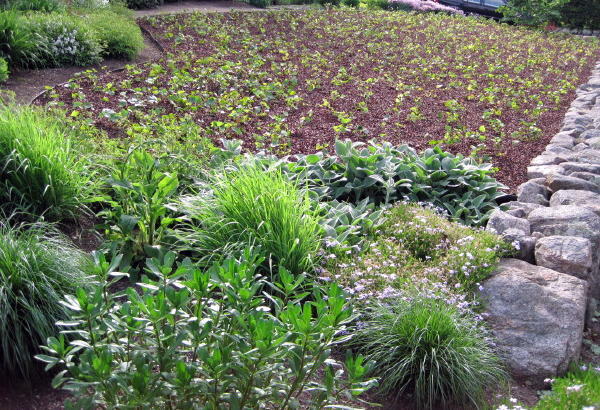 Groundcovers, perennials and flowering shrubs are combined for texture, color variation and year-round interest in my backyard shade garden. 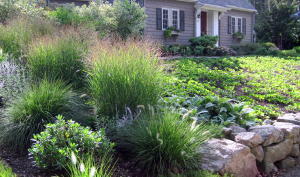 This entry was posted in Groundcovers, Landscape Design, Lawn Alternatives, planting, Uncategorized. Bookmark the permalink. Wow Denise! What a treat to see all these luscious images as autumn is taking hold. Thank you for the great resources and inspiration for next year. As a friend and neighbor I have had the chance to watch this ivy process from the beginning. It looks so lush and so beautiful and so green. I can hardly believe how quickly it has grown.It already looks as if it has been there for years. And I could not agree more with your comments about all the mowers and blowers. 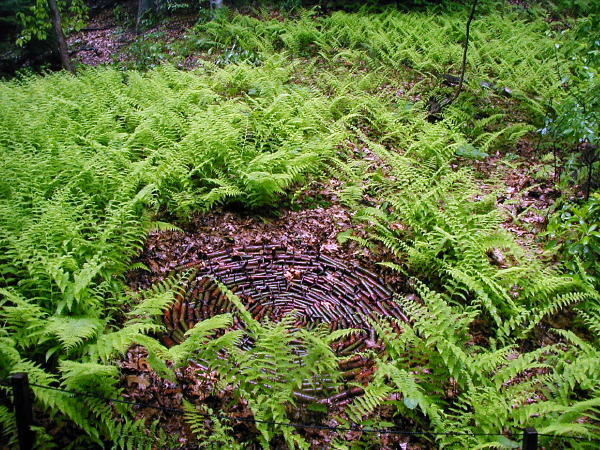 You really have inspired many of us to go the ground cover route. Thanks! 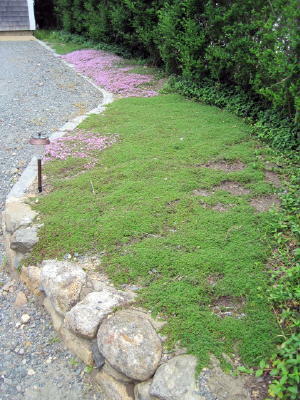 As a client (too), you were an early convert to a lawn alternative solution using moss and spreading shrubs…think of all the hours saved in maintenance, not to mention the beautiful look. Thanks, Christine.